Brett acting in new play at Under St. Mark’s! The brilliant #serials piece WOMEN by Chiara Atik has been turned into a 50-minute comedy to premiere at UNDER ST. MARK’S THEATRE in January! 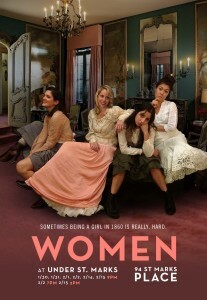 The show is a hilarious combo of Louisa May Alcott’s LITTLE WOMEN and the HBO show GIRLS. Tix are $12. Click the photo to buy tix!